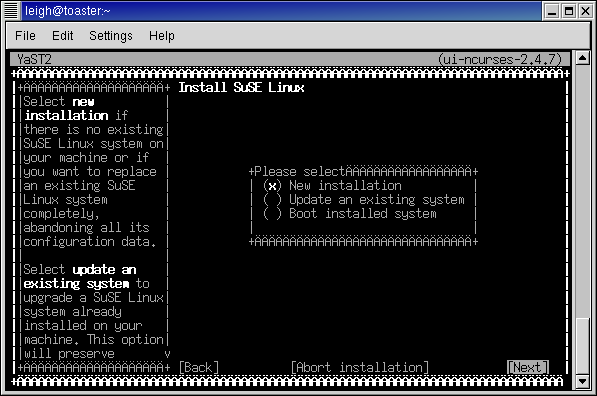 This walkthrough shows a simple installation of SuSE Linux 7.3 on a 7043-140. As there are a large number of different options during the installation it cannot show everything. 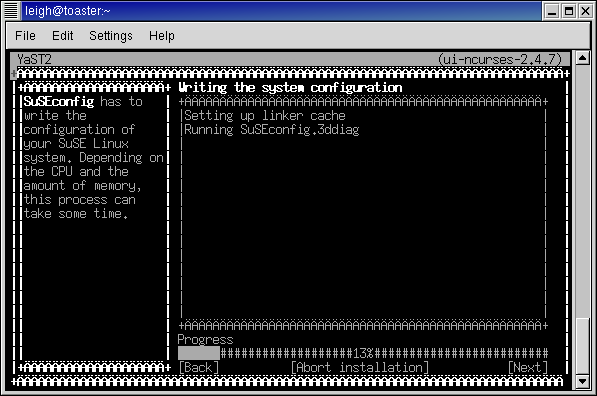 Note: this walkthrough starts after you have loaded the SuSE installation ramdisk. Refer to the booting walkthrough for how to get to this point. 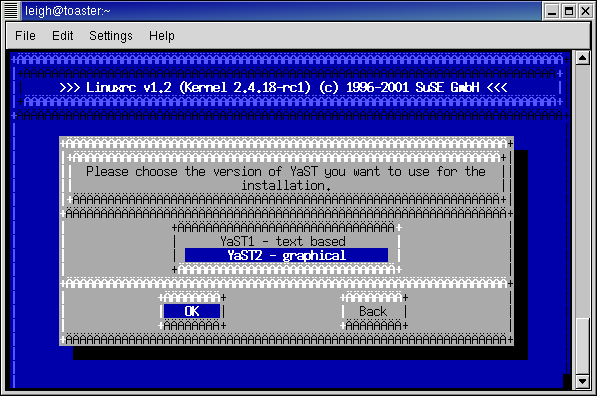 SuSE has two installation programs, called YaST1 and YaST2. Although it says that YaST1 is text and YaST2 is graphical, that is not strictly true. Or, rather, it's totally false. 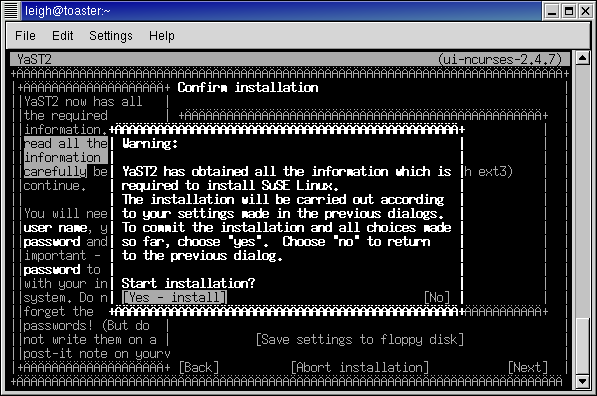 In fact, the YaST2 text mode installer is far superior to the YaST1 one (IMO), so we'll use that one. Ensure YaST2 is selected then press ENTER to proceeed. 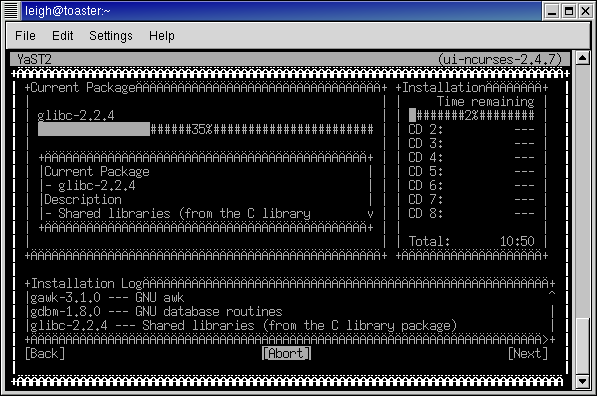 Note: I have been told that Hyperterminal for Windows does not work very well during the installation, so if you have problems it might be worth finding a better terminal emulator. Because I wanted to keep my existing installation (on the first hard disk, /dev/sda) I performed the installation on the second hard disk (/dev/sdb). 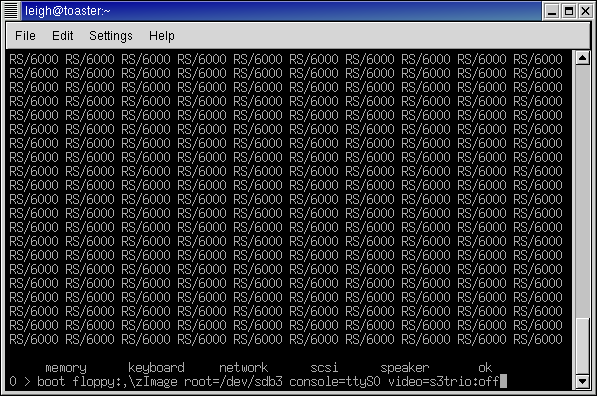 The screenshot above shows a single partition on that disk, which I normally use for testing new kernels. After you have erased the partition table and disk label you need to go to the previous screen and back again to let the installer re-read the partition table. 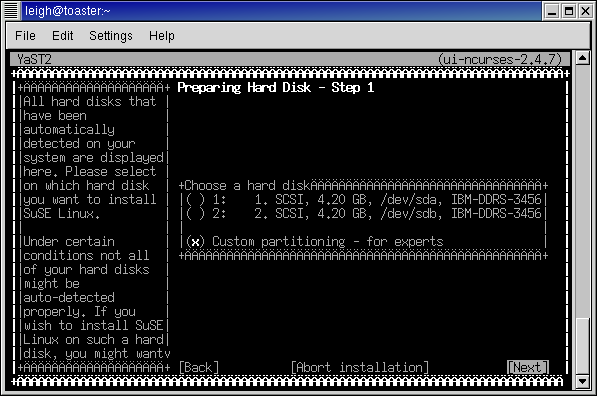 After you've done this, the disk will have no longer have any partitions on it. 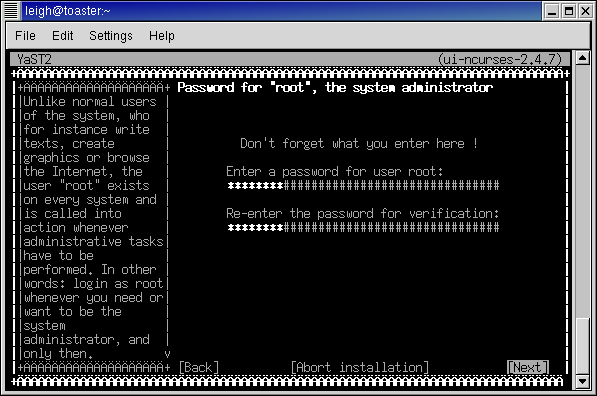 In the "Format" box, select the "Do not format" check box and manually type in a partition type of 0x41. Why this is not one of the selections I do not know. In the "Size" box, leave the start cylinder at 0 and select a size of "+4M". 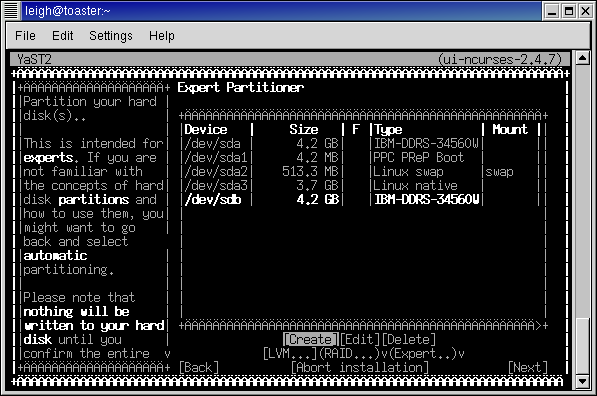 Note: If the PReP boot partition is too big your system might not boot. Select OK to create the partition. 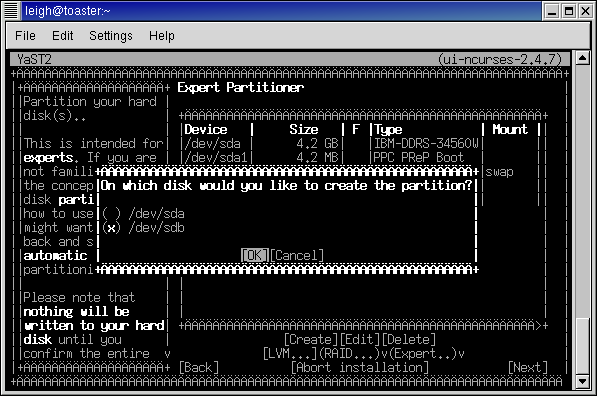 Select the "create" option again and select the correct disk to create the partition on. 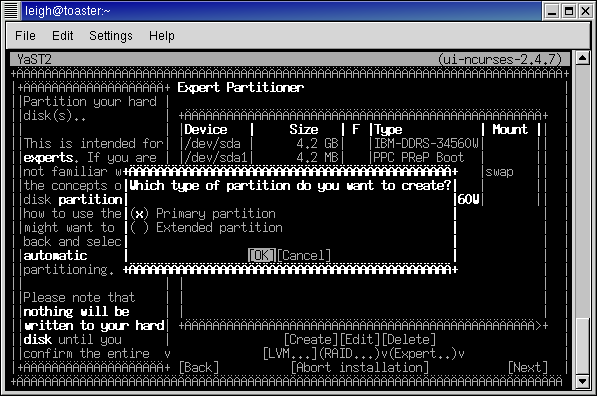 Because there are only three partitions required in this walkthrough, I will create them as all primary partitions. 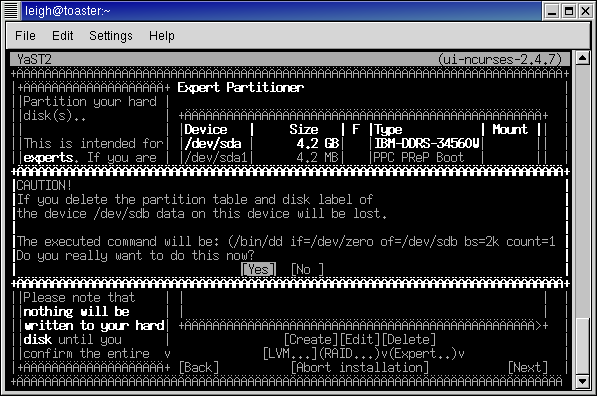 If you require (or will require in the future) more than four partitions, you can create these partitions as secondary partitions. One point to note is that the installer automatically chooses the first swap partition it finds as the installation swap partition, which in this case is the swap partition from my main installation. This is not strictly correct for this example but doesn't cause any problems because the system will still boot correctly with a swap partition. This problem can easily be corrected after the installation is complete, but I won't show how to do this here because most installations will be onto a single disk where this problem will not occur. Select "Next" to proceed to the software selection screen. 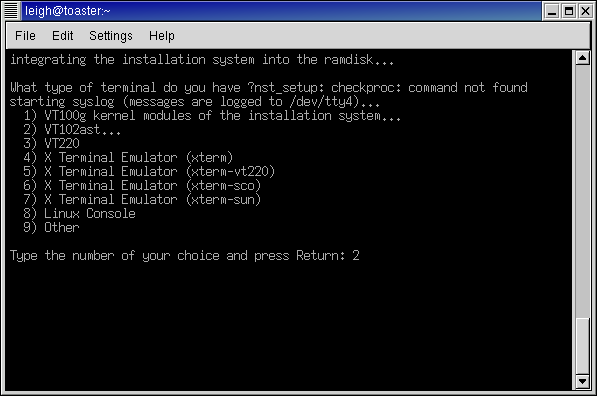 In this example, I will select the "Default system" installation option. However, feel free to select the "Detailed selection..." option to select any additional software you require. 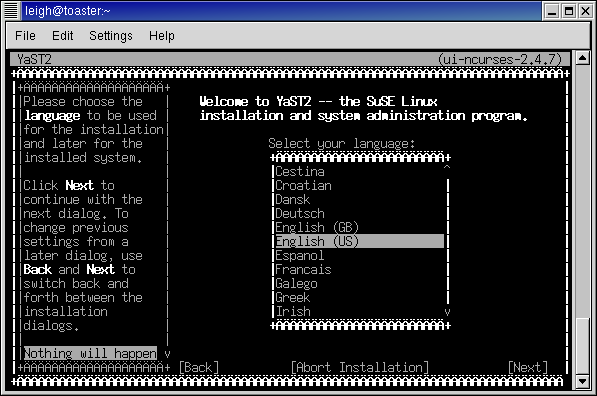 The installer will now install the software which is you cue to go and make a fine beverage. Go on, it's traditional! However, finish reading the walkthrough because there are a couple more things worth knowing. There are two things to know at this point. The first is that the system doesn't seem to reboot properly every time. If you get a blank screen and no disk activity then leave the machine for a minute or two then power it off and on again. At last ... you get the login prompt! 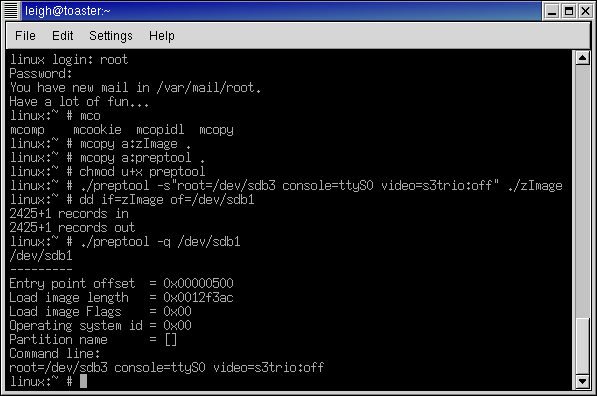 Note: you need to do the following configuration before you reboot.